With the NCAA tournament down to its final four teams, both Kentucky and Duke are favorites in the semis to advance to the championship game. As intriguing of a matchup as that would be on the court, the head-to-head coaching battle might be even more so. John Calipari vs. Mike Krzyzewski. One coach is seen by many people to be the face of corruption and all that is wrong with college basketball. The other is viewed as the coach with a pristine image—a man who seemingly always runs a clean program at Duke and who stars in credit card commercials. But it’s not that simple. Both Calipari and Krzyzewski have had their share of controversies as head coach. One&apos;s is just more widely publicized. Coach Cal’s transgressions at the collegiate level are very well known. While at UMass his &apos;95-&apos;96 team led by Marcus Camby made their way to the Final Four. It was later found that Camby had accepted $28,000 in gifts from an agent and he should have been ineligible during those games. The NCAA decided to vacate their wins, even though, you know, the games still happened. You can even watch their Final Four game against Kentucky on the NCAA’s YouTube channel. An academic scandal involving Derrick Rose while Calipari was at Memphis resulted in a three-year probation for the program and the NCAA “vacating” their 38 wins and their Final Four appearance during the 2007-2008 season. Funny enough, the Memphis-Kansas championship game is also available on the NCAA’s YouTube Channel (gotta make those free throws, Memphis). Hall of Fame coach Bobby Knight (among others) criticized Calipari heavily for those incidents. “You see we&apos;ve got a coach at Kentucky who put two schools on probation and he&apos;s still coaching,” Knight said in 2009 at a fundraiser. "I really don&apos;t understand that." 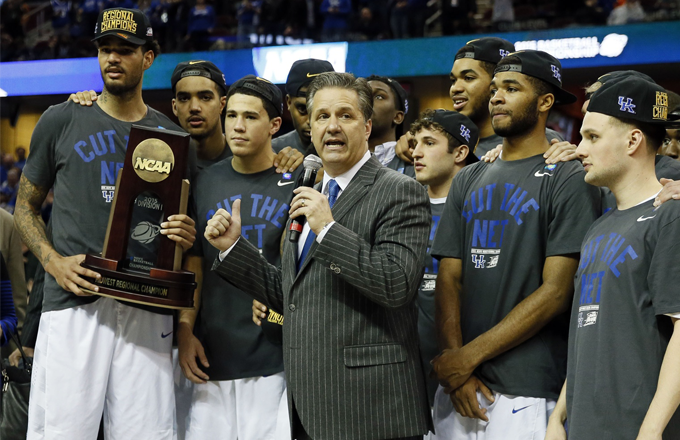 Of late, Coach Calipari has become known as the “one-and-done” coach in college basketball. He regularly lands McDonald&apos;s All-Americans; players with such high ceilings that they will probably only stay in college for a year before leaving and declaring for the NBA Draft. The list of examples include former NBA MVP Derrick Rose, Phoenix Suns guard Brandon Knight, former Wooden Award winner Anthony Davis, Charlotte Hornets forward Michael Kidd-Gilchrist, and almost certainly at least three members of Calipari&apos;s current team. Once again, Bobby Knight (among others) criticized Calipari, albeit a more indirectly than before. So, where&apos;s the criticism for Coach K? The thing is, Mike Krzyzewski has also had players who could or should have been ineligible, yet they still ended up playing entire seasons. Corey Maggette, who helped lead the Blue Devils to the championship game in 1999, admitted to accepting $2,000 from an AAU coach while in high school. The NCAA decided not to punish Duke. No one was punished. No wins were vacated. No fines. There was another issue of possible “impermissible benefits” with Duke forward Lance Thomas. In December 2009, Thomas paid a $30,000 down payment on almost $100,000 of jewelry and was approved for more than $67,000 in financing from the jewelry company. Questions arose as to how Thomas had the money for the down payment, and why the company decided to give him that much in credit. If Thomas was ruled ineligible, Duke might have had to vacate wins and possibly their 2010 national title. Once again, the NCAA handed down no punishment. Oh, and about that laundry list of one-and-done players for Coach Cal? Coach K has a few of those under his watch, too. Some of those names include Luol Deng, Kyrie Irving, Jabari Parker and probably Jahlil Okafor at the end of this year. 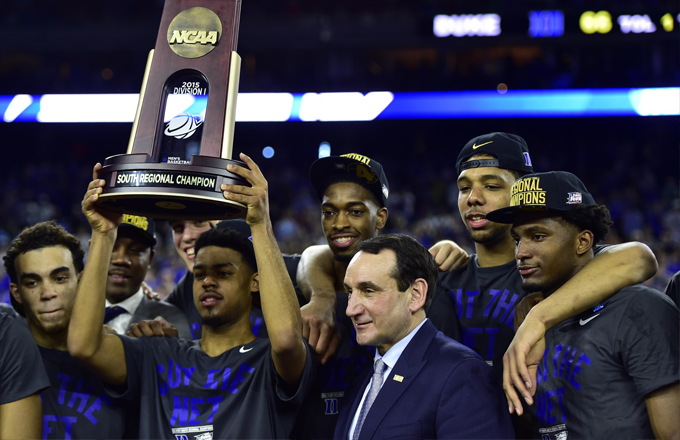 The NCAA decided not to punish Duke. No one was punished. No wins were vacated. No fines. Coach Cal and Coach K are perceived as two vastly different people but share the same goal and surprisingly similar techniques. For as unconcerned John Calipari is with how he is perceived, Coach K thrives on his positive public perception. Krzyzewski is the man in the commercials; the face of college coaching. He&apos;s also a man who, albeit 25 years ago, screamed and cursed at student reporters for giving his team at the time a B-plus overall grading. Perception is key for Krzyzewski—not so much for Cal. Coach K’s desire for great PR is what differentiates the two, and is a significant part of the reason (along with his on-court success) why you’ll see Krzyzewski in those credit card commercials and coaching Team USA. No matter how they are viewed by the overall public, there is no doubt that both men have faced their share of controversy while coaching. It&apos;s just that Calipari has been the only one actually being punished. When it&apos;s all boiled down, when you strip away the years of nationwide scrutiny and praise, these are just multi-millionaire coaches doing whatever they can to get their group of unpaid laborers to win as many games as possible. Guess they aren&apos;t so different after all.